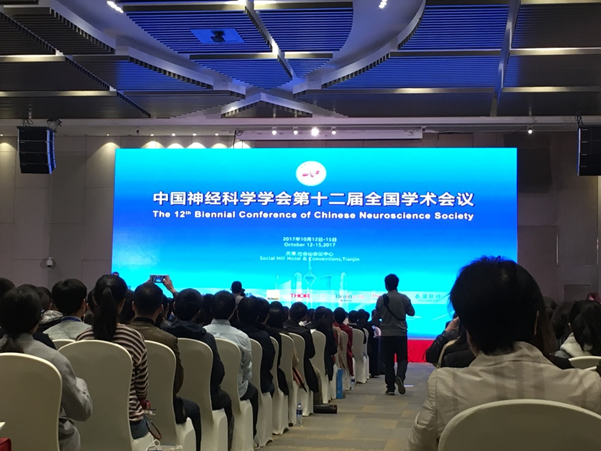 As a recipient of the Chinese Neuroscience Society (CNS) Travel Award, I had the honour and pleasure of traveling to Tianjin, China to attend The 12th Biennial Conference of Chinese Neuroscience Society from October 13th to 15th, 2017. The conference featured a number of high-profile speakers from a wide range of subdisciplines in neuroscience for its plenary lectures, including Drs. John Rubenstein, Chris I. de Zeeuw, Klaus-Armin Nave, Yimin Zou, Sheena A. Josselyn, Carsten K.W. De Dreu, and Qiufu Ma. The lecture by Dr. De Dreu on the neurobiological basis of human conflicts was especially interesting, as he described a series of experiments using human volunteers, designed to examine factors which affect in-group cooperativity during the decision-making process for aggressive and defensive behaviours. The findings by his research group are a great example of neuroscience not only impacting the world with relation to human health, but that it also has broad implications on ecology, socioeconomic issues, and global geopolitics. Aside from the plenary lectures, there were many symposiums covering different research areas including ones related to my current research and cutting edge techniques such as brain organoids and 3D bioprinting that I am interested to employ in my future research. On the second day of the conference, I had the wonderful opportunity to present a research poster on my work at RIKEN Brain Science Institute examining the link between impaired protein homeostasis and neurodevelopmental disorders. It was a great chance to have discussions with young researchers from various backgrounds and I was able to receive great feedback on my work. The CNS Travel Award was a great chance for me to see first-hand the breadth of neuroscience research going on in China and meet fellow young scientists from there. I would like to express my gratitude to both Chinese Neuroscience Society and Japan Neuroscience Society for having such exchange programs, and I hope that other JNS members will take advantage of the same opportunity two years later to attend the next CNS conference!